Investing in a misting system or portable misting fan is going to be the coolest decision you ever made for your home patio or commercial property! 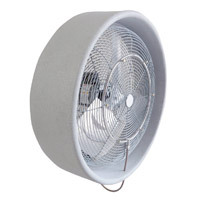 How does a temperature reduction of up to thirty degrees Fahrenheit sound to you? When you work with Advanced Misting Systems, you gain partnerships with some of the best experts in the industry. We have more than 20 years of experience in helping customers nationwide select the right cooling products for their needs, and we don't stop at the sale. We provide around-the-clock advice and installation tips for professional and DIY installation of mist systems, fans, evaporative coolers, and more. 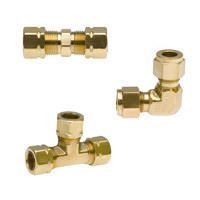 All sizes and types of nozzle heads, replacement lines, fittings, and more. 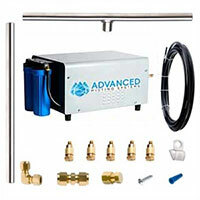 Complete pre-selected misting systems for DIY installations, available in multiple lengths and pressure pumps. 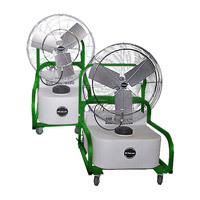 Multiple options of oscillating fans in two sizes with various pressure pumps. 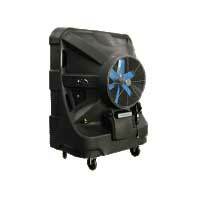 Latest portable mist fan options from J&D Manufacturing, Air Chiller & more. 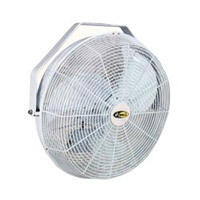 Mobile misting fans for sporting events, backyard gatherings & fire rehab. 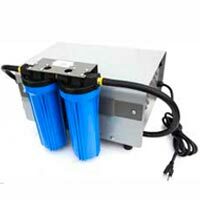 Available in 18", 20", 24", 26" and 50"
Try our best seller 1000 psi mist pumps and other misting system replacement pumps in various pressures (120V, 220V and 230V+). Multiple coolers from Port-a-Cool to choose from. Free shipping on select models. 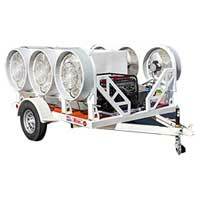 Rent or buy portable cooling trailers for uses on the go, such as military training facilities , fire rehab, concerts, outdoor sporting events & much more! 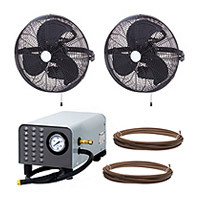 Choose either 24" or 30" Dayton, Polychiller ™ & Air King ® high-powered fans. Optional wall-mount kits available too. Our products can even be used for dust and odor control. Mist is great to help control both of these for industrial, agricultural, equine, and many other industries. The mist itself captures dirt and other airborne particles, contains them, and then releases them at ground level. This helps improve air quality for both workers and animals. No matter whether you plan to use it for recreational or business purposes, installing a high-powered system or fan is cooling and energy-efficient. Shop online or get personal support today by calling 1-760-779-1352.